For Mother's Day we went to Cleaver for brunch. I was very excited. I have heard great things about this place from so many people and I was eager to try it for myself. It's located on 17th right between Ming's and Ox and Angela. 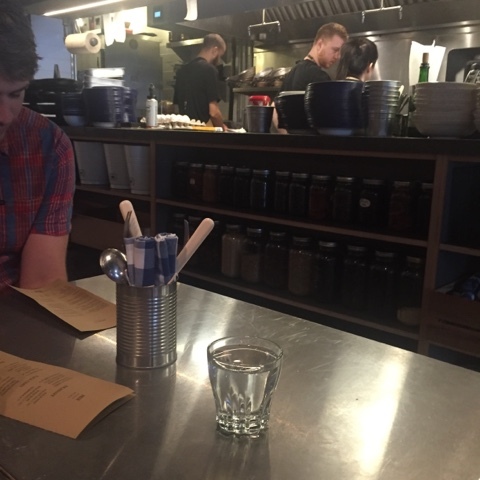 The restaurant is small and very rustic. Finley loved all the decor and said it was really cool. Penelope replied with that's because the door is open. It made Greg and I laugh quite hard but neither girl really figured out why. I love going to restaurants that have the open kitchen, especially with kids. They love watching them cook. 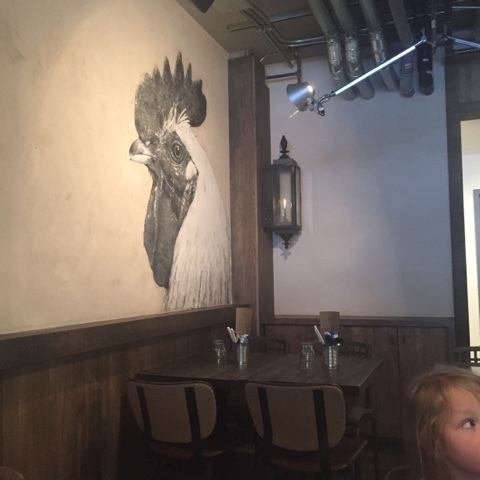 Loved the wall decor, the tin cans to hold cutler and napkins and the blue and white checked napkins are an added touch. 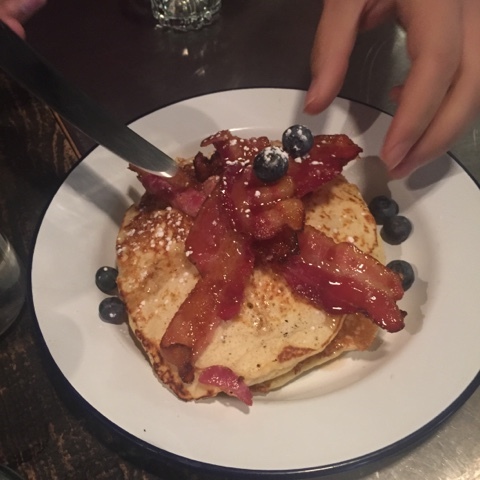 The girls got pancakes with bacon, blueberries and maple syrup. The berries were so sweet and delicious. 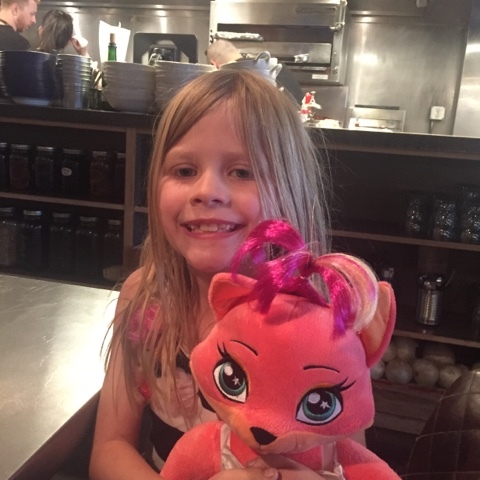 I got to eat Finley's because she is a weird child who does not like them. 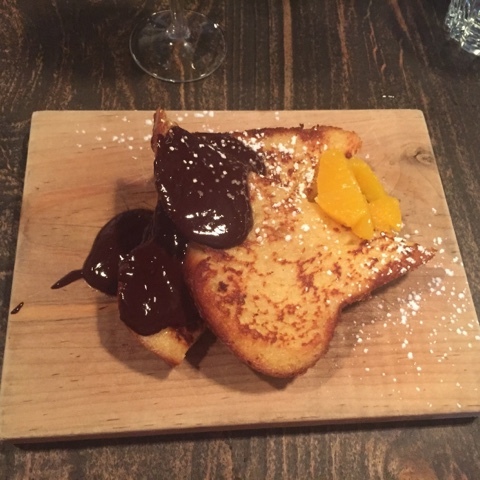 This was my breakfast - french toast, chocolate sauce and boozy oranges. It was delicious. Penelope was bagging to try it and she was trying to steal it throughout the meal. Needless to say, this is what she will be ordering next time. She was still talking about it this morning. Not sure what booze they use in the oranges but it was amazing and didn't taste too boozy. 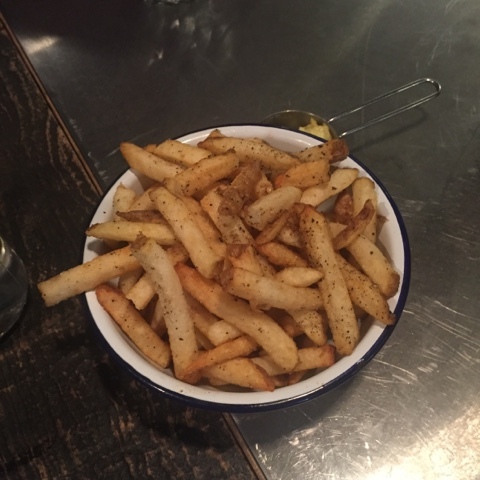 We also ordered duck fries and they were quite possibly the greatest fries I have had in my entire life. They came with a curry mayo sauce which I did not like but Greg did. Finley loved these fries too but Penelope didn't. Seriously you have to try these if you come here. 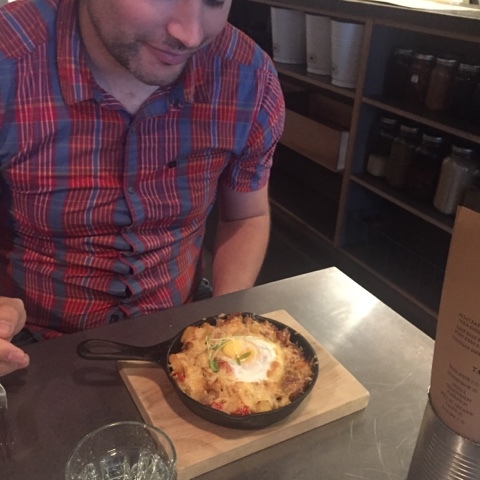 Greg had the hangover hash and he said it was really good. Cleaver doesn't normally have brunches so if you hear they are having one, you should really check it out. You won't be disappointed. I do know that they are having a pop up brunch on the Saturday, Sunday and Monday of the long weekend if you are interested. Deets are on their website. Can't wait to come back for supper! !